Here are some estimates of damages done to several Missouri counties. These were reported to C.V. Riley, Missouri's state entomologist, in 1875. "In making an estimate in figures of the amount of damage done by the locusts, several important considerations must be kept in view. First, it is impossible to arrive at strict accuracy, for we have no such means of collecting facts covering a whole county, as would enable us to ascertain the exact damage upon each farm or quarter section. Then the amount of injury to fruit and gardens, and the permanent injury to fruit trees, meadows and pastures, can scarcely enter into our calculation. The number of improved acres varies in counties of nearly the same area. Different counties received different measures of harm, owing to the different character of the surface, the relative amount of timber, etc. "The immediate damage was the loss of labor expended in planting, and the seeding for about two thirds of the crop acreage of the country, to which the destruction of the tame grasses and fruit may be added. The values of these it is difficult to get at. I have requested a number of correspondents to give an estimate of the probable damage in their county from the young locusts, and I append a few of the answers as samples, from counties which received the greatest injury. Many find it impossible to make an estimate, while a few deem that their counties, for one reason and another, were not materially injured by the locusts. "The foregoing estimates exceed the amount of $15,000,000. They are arrived at, in the majority of instances, by combining the following elements: The number of acres of crops destroyed; the average amount of the crop; and the value of the crop, allowing forty cents a bushel for corn, one dollar for wheat, one dollar and a half for barley, and thirty cents a bushel for oats. The amount of loss redeemed by crops that succeeded after the insects left, it is impossible to determine; and yet this amount may again be offset by the injury both temporary and permanent, to fruit, fruit trees, vineyards, gardens, meadows and pastures; by the fact that such crops as flax, castor-beans, etc., have not been estimated in the calculation; and lastly, by the injury to stock, the animals necessarily driven out of the country, and the general depreciation of property. The counties of Cedar, Dade, Hickory, Lawrence, McDonald, Nodaway, and Polk, have, moreover, been omitted from the calculation, for want of sufficient data on which to base estimates. "I spent some time in this county, and the gloomy outlook toward the end of May could not well be exaggerated. The stench from the immense numbers that were destroyed around Kansas City, was at one time unendurable, and lest it should breed pestilence the authorities of Westport took measures to deodorize and disinfect the atmosphere on a large scale. Fifteen barrels of locusts were one evening shoveled up and hauled from the base of the court house at Independence, each barrel weighing 220 pounds. These were only a portion that were unable, after a hard days' battle, to get inside where there was a luxuriant growth of blue grass." It appears that the grasshoppers being shoveled up from near the court house in Westport, must be referring to grasshoppers that had been hauled in by farmers participating in the restitution program. Figures that indicate the amount spent by the state of Missouri for such grasshopper restitutions have not been found. However, we do know from Missouri legislation that the state offered $5 for a bushel of grasshopper eggs and $1 for a bushel of grasshoppers. 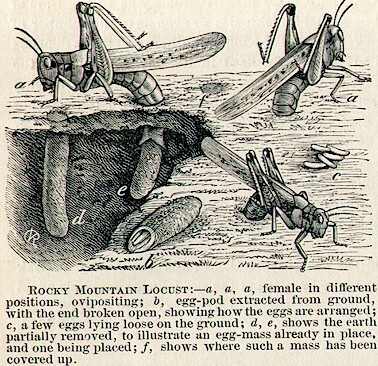 Can you imagine how difficult it would have been to collect a bushel of grasshopper eggs! This page was designed and is maintained by Aaron Rieder and Lyndon Irwin.